Planning permission has just been granted for a new mixed-use development in South London. The faceted design will see seven residential units and two live/work units replacing the existing light industrial buildings. 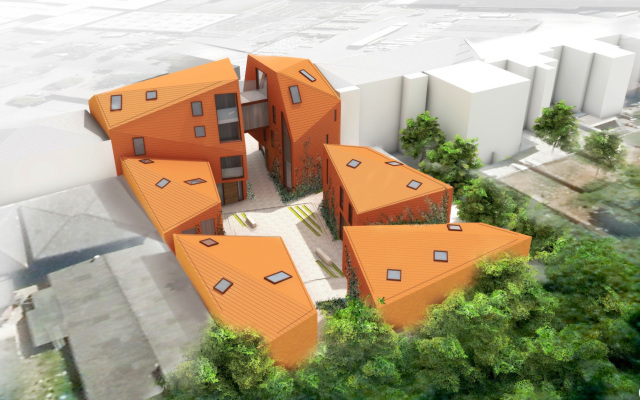 Four houses will face onto a shared courtyard to the rear, fronted by a three-/four storey residential block. The front is divided into two, allowing access to the new mews to the rear. The buildings have been sculpted to maximise light into the courtyard, as well as creating south-facing solar roofs for solar panels. The design has been carefully considered to meet modern standards and requirements, as well as creating an elegant redevelopment in the Forest Hill area.